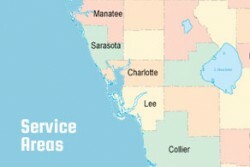 There are many organizations and buildings in Sarasota, Florida, that require fire equipment and services and ABC Fire Equipment offers a full range of service to this area. If you are looking for a reliable company that provides exceptional service to their clients, look no further than ABC Fire Equipment. We are happy to answer any of your questions, or provide a custom quote for your fire needs in Sarasota, FL.